Sap bleeds from a peach tree infected with cytospora fungus at Talbott Farms in Palisade. The fungus is causing Grand Valley peach growers $6 million annually. GRAND JUNCTION (AP) – A silent killer steadily encroaching on the most beloved of Western Slope fruit has moved into the crosshairs of peach growers and researchers. It’s a fungus so widespread that every orchard in the valley is infected, it’s estimated to cost the local peach industry about $6 million a year, and there’s no silver bullet to eradicate it. But the good news is that researchers with Colorado State University have found promising results and have discovered a potential way to manage this devastating fungus, called cytospora. Though it has become an epidemic in Western Colorado orchards, managing it could be as simple as painting trees with a special mixture to protect them and avoid spreading the infection. This hard-to-pronounce fungus causes a disease called cytospora canker, which leaves behind a distinct calling card in orchards. The fungus spreads through spores and enters trees through wounds or cracks in the bark. Once established, it girdles trees from the inside, causing telltale dead branches and eventually killing the entire tree. Researchers realized something needed to be done after initial surveys of orchards in 2015 revealed that every orchard in the valley had some infection and estimated, on average, 75 percent of the trees in the surveyed orchards had been infected with cytospora. Many of the orchards were fully infected, especially if their trees were old enough to be in full production. 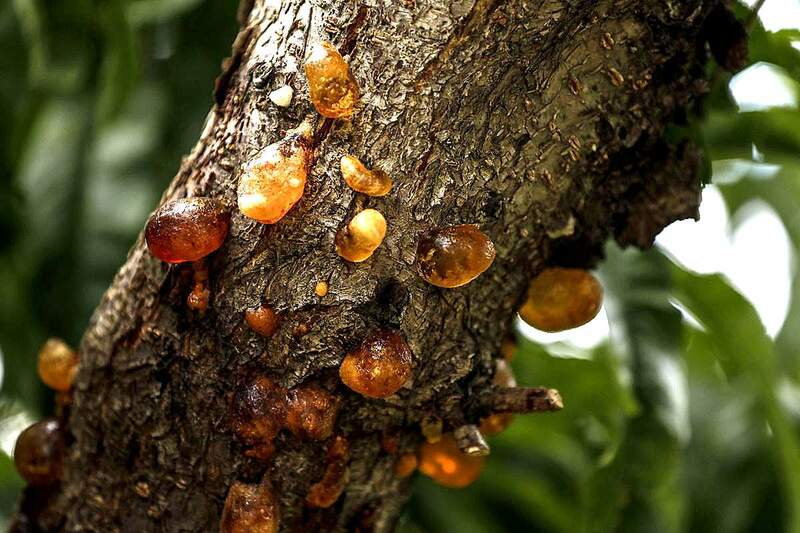 When CSU pomology assistant professor Ioannis Minas first walked through Palisade-area orchards, he noticed the oozing, the trees’ futile attempt to push the fungus out with dripping, amber-colored sap. No matter which orchard he visited, there it was, a sticky reminder of the persistent infection. “It was this cytospora gum rain,” he said. But the attitude he encountered at the time was one of resignation, in which peach growers had come to accept their trees wouldn’t last more than a decade after they were planted and the last few years of production would be a matter of lopping off dead limbs, milking the rest of the tree for as long as the peaches would grow for market. Other stone fruits are also susceptible to cytospora infection, including cherries, apricots and plums, but it’s most evident in peach orchards. “Cytospora has always been here; it’s become a much bigger issue in the last 20 years,” said Bruce Talbott, who manages the Talbott Farms’ orchards. Temperature swingsThe worsening situation is one that Talbott attributes to several factors – the planting of newer varieties of peach trees that are less resistant to the fungus, increased use of sprinkler irrigation and extreme temperature swings in the wintertime that expand and contract the tree bark and leave cracks behind. These tiny fissures are just the sort of environment cytospora spores like, and the opportunistic fungus takes hold. Talbott said he has noticed increased cytospora infection after winters where temperatures drop to 10 or 15 below zero at night, and then the next day’s high temperatures reach the upper 30s. These wide temperature swings are key to researchers’ hypothesis explaining why cytospora is a devastating issue in Western Colorado, but not other peach-growing regions like Georgia, Michigan and California. Despite increased humidity in those areas, which would likely be a better climate for fungus to thrive, those regions don’t have the fatal results cytospora inflicts here. It’s seen as a pretty weak adversary to the industry elsewhere, but those places don’t have the unique climate that produces cool nights and hot days, with extreme temperatures like the Grand Valley. Shorter lifespansSurveys conducted by CSU indicate the losses to the peach industry locally are as much as 20 percent of revenues every year, which amounts to about $6 million annually. It’s a problem that has slowly become more and more expensive, more devastating and more prevalent across the Grand Valley’s orchards. One of the most costly effects of cytospora infection is the shortened life of peach trees. Orchard managers plan on trees lasting about 20 years when they’re planted – accounting for five years of growth, 10 years of full production, and the last five years getting whatever’s left of the tree before they yank it out and start over. But cytospora has reduced that time frame tremendously. Last year, Talbott Farms removed about 10,000 trees between three orchards – one planted only four years earlier and two others that lasted only six and eight years. “I can’t afford to do that every year,” Talbott said, estimating his family orchard spends about $1 million per year to deal with cytospora losses. Using latex paintWhile spring frosts are still the biggest threat to the industry, cytospora isn’t far behind. Finding a reliable solution to keep the fungus under control hasn’t been easy. Initial attempts to test 20 different chemicals on cytospora-infected samples showed none of them provided 100 percent control, Minas said. “That’s when I said, ‘we are really in trouble now,’” he said. Further research indicated some chemicals are more effective than others, according to current trial results. Those chemicals are two fungicides called Topsin and Captan, and combined with latex paint and applied to trees, they’ve proved to make the biggest difference of anything they’ve tried so far. The best results for suppressing the fungus have come from mixing fungicide with white latex paint and applying it to young trees to prevent infection, as well as covering pruning wounds and existing cankers to prevent them from spreading spores. The latex paint is partially permeable, so it doesn’t interfere with transpiration, the process by which water moves through the plant and evaporates through small openings in the bark and woody stems. The light-colored paint also reflects heat, keeps the bark temperatures more consistent and keeps the chemical on the tree longer than if it was applied by itself. The goal is to prevent infection in the first place, continue to prevent infection when trees are pruned and have open wounds susceptible to infection, and create a reliable way to manage orchards and save money on maintenance, time and the cost of re-planting trees. “We are developing a protocol now on how to best manage orchards from the beginning, from when the trees are first planted,” Minas said. CSU plant pathologist Jane Stewart and graduate student Stephan Miller are part of the team working on a solution for peach growers. It’s a process that peach growers are watching carefully, because this applied research is something they can put to use immediately in their orchards.